Your customer's journey is crucial for building long-term loyalty. That's why your marketing strategy isn't one you can set and forget. It's crucial to have a top level look at the entire customer journey -- and understand that it might even be more than one journey. 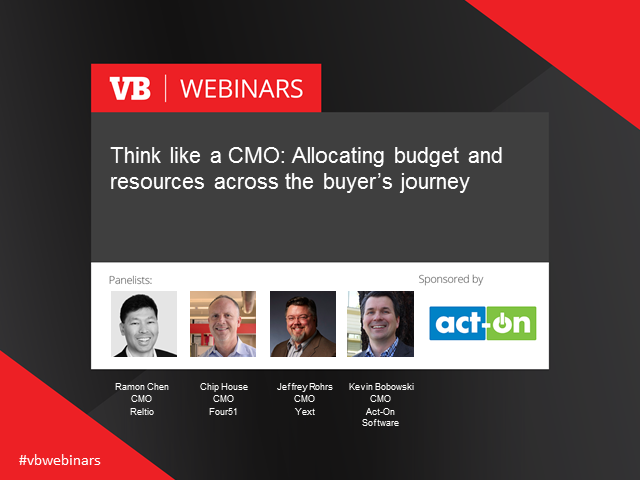 How are leading CMOs at top-performing companies planning to spend their budget and time across the buyer’s journey? From brand marketing, to demand generation to expanding customer advocacy, this webinar will illuminate where marketing leaders are allocating their money and efforts, and the key performance indicators used to measure the success of marketing teams throughout the buyer’s journey. We've gathered together top CMOs for a one hour candid look at their best advice for nailing the key components of the customer's journey. You'll learn which KPIs to watch, how best to budget across the board and what you're not measuring correctly -- or at all. Join this panel discussion as we take a deeper look at where marketing money is going – and why. Register today for this free CMO roundtable discussion with interactive live audience question and answer session!